Many organizations have their own initiatives to increase awareness concerning food waste, as well as efforts to reduce food waste, as the issue has garnered national attention for its urgency. Here are some ways that California has taken the lead on the fight against food waste. Food rescue projects that result in rescued food being distributed to people. The grant application deadline is July 18. Program funding ranges from $25,000 to $500,000. This program is the first of its kind in California and offers groups such as food banks and food pantries funding from the state to acquire much needed resources like refrigerated trucks and staff time. Take advantage of this while you can! CalRecycle, in conjunction with the California Air Resources Board, is also holding public workshops and requesting public input for policy implementation recommendations for achieving the goals and mandates set forth in SB 1383, the Short Lived Climate Pollutant Reduction Act. One of those mandates includes a 20% reduction in edible food waste that is sent to landfills by 2025. These initiatives will help the state get one step closer to realizing our edible food recovery goals. National trade associations have joined forces to standardize date labeling on food packaging among their members. The initiative would result in only two phrases used on packaging (“BEST If Used By” for quality and “USE By” for safety), instead of the plethora currently in use that lead to consumer confusion, and ultimately, food waste. This food date label initiative, along with CAW sponsored legislation AB 954 (Chiu), encourages manufacturers to use uniform phrases. However, these efforts will eventually lead to more widespread use of these uniform phrases for date labels that will decrease food waste. AB 1219 (Eggman), the California Good Samaritan Food Donation Act, which CAW is a co-sponsor alongside the California Association of Food Banks (CAFB), provides statewide outreach for Good Samaritan laws which protect good faith food donors along, which is something that has not yet been done. Despite existing federal and state protections, many businesses are still fearful of being sued because of donated food. AB 954 and AB 1219 have both passed the Assembly, Senate policy committees, and will now be heard in the Senate’s fiscal committee before being voted on by the entire Senate floor. Read more about these measures here. The consequences of food waste and the ways in which food waste can be avoided are slowly becoming better understood and more widely discussed. Let’s keep food waste on our state’s agenda, and we’ll find more ways to waste less good food and help the Earth too. 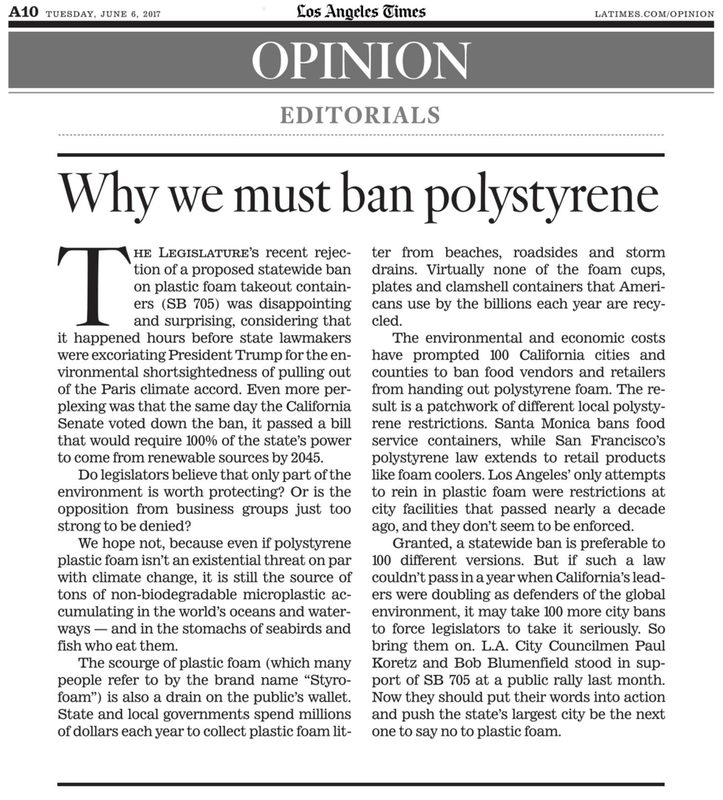 The notion of living plastic-free seems quite daunting, and maybe a little silly. July is Plastic-Free Month, so we thought this would be the perfect opportunity to reassess our lifestyle choices and be more mindful of our actions and their environmental consequences. Changing your lifestyle so drastically may appear fruitless in the grand scheme of things, but making these small changes makes a world of difference, trust me. 1. Buy and store in bulk. Bring your own reusable containers and bags to the grocery store. Buy products in bulk to save on cost and unnecessary packaging waste. This will also encourage you to follow a less-processed (and more vegan) lifestyle. 2. Use natural remedies for personal care. Have fun experimenting with recipes to make your own beauty and personal care products, instead of buying commercial products with plastic packaging and harmful chemical additives. 3. Start composting. You’ll learn that once you begin eliminating your wet waste (fresh produce) from your waste stream, you’ll no longer need plastic garbage bags. Composting is extremely convenient, can happen right in your backyard, and is great top soil for your home garden! 4. Learn to bring your own. Get into the habit of bringing your own reusable straw and takeout packaging. Living plastic-free may seem to isolate you from certain activities, but it doesn’t have to if you make a point of coming prepared! 5. Start collecting your waste. Keep a bag of all your plastic waste. You will become more cognizant of your consumption habits and be more likely to institute change. Our patterns of consumption are so engrained that we often overlook all our instances of waste. Slow down and try to understand all your purchases and activities that involve or further encourage your use of plastic. For inspiration and more ideas, check out Beth Terry’s website at https://myplasticfreelife.com. The following text is from Sea Change Radio's website. See the original webpage here. In 2013 California boasted a recycling rate of 85%. In 2017 that number is now 79% – that is the first time it has dipped below 80% since 2008. Why is the most populous state in the union moving in the wrong direction on this important indicator? This week on Sea Change Radio we speak with Mark Murray, executive director of Californians Against Waste, a nonprofit environmental group that was founded forty years ago to advocate for beverage container recycling in the state. He will explain this troubling trend and talk about what can be done to get California’s recycling program back on its previous trajectory. The following text is as published by the San Diego Union-Tribune Editorial Board on May 22, 2017. See the original article here. The following text is as published by the San Diego Union-Tribune Editorial Board on May 18, 2017. See the original article here. Hundreds of recycling locations have closed in the last 14 months due to a drop in commodity scrap values, and a subsequent failure of the Bottle Bill's ‘Processing Payment’ mechanism to offset that drop in value as promised by statute. • As a direct result of these reduced payments, 493 recycling locations have closed. • Rural areas have been particularly hard hit, with some areas of the state now having little or no practical redemption opportunity. Closed centers have been replaced with pseudo-redemption at hundreds of retail locations, which has proven to be ineffectual, costly and inconvenient (for both consumers and grocery stores). CalRecycle data shows that recycling levels have dropped across the state, with especially significant drops in Northern California, and consumers are foregoing as much as $335,000 per month unredeemed deposit (California Refund Value or “CRV”) compared to 2015. • A short term, temporary urgency bill is needed to address the flawed payment shortfall at the root of the recycling center closures. 1) Return the Recycling Cost basis for Processing Payments to 2015 levels and adjust processing payments retroactive to January 1, potentially increasing payments to recyclers by $17.9 million in 2017. 2) Authorize CalRecycle to offer Handling Fees to any recycler willing to set up business anywhere (mobile or stationary) within a currently unserved zone. 3) Temporarily suspend costly enforcement efforts on beverage dealers in recently unserved zones, redirecting staff and resources to recruiting and siting viable recycling center operators in unserved zones. Without these urgent amendments, centers will remain closed, rates will continue to fall, consumer frustration will grow, and efforts to find a ‘comprehensive fix’ will continue to be undermined by a compromised infrastructure. Assemblymember David Chiu (D- San Francisco) has introduced AB 954 which seeks standardize phrasing used on printed food date labels, in an effort to reduce the 20% of consumer food waste that comes from confusion with date labels. Last year CAW teamed up with the Natural Resources Defense Council (NRDC) and Assemblymember Chiu to sponsor AB 2725, a bill which would have standardized the dizzying variety of phrases used on food date labels in order to reduce food waste. Food date labels come in a variety of phrases, such as "Enjoy by", "Freshest by", "Best By", "Sell By", and so on. The bill would have required only one phrase to be used to communicate quality and one phrase to be used to communicate safety, along with prohibiting consumer visible sell by dates which provide no useful information to consumers. Due to industry opposition, AB 2725 did not pass, but we continued to work on the issue and pushed for the industry to work to solve this problem. Many food date labels have nothing to do with safety and are merely a best guess by the manufacturer of how long the product will be at it's peak freshness. Despite this, many cautious consumers see these dates and toss out perfectly healthy and wholesome food just because it is past "the date". This is not only a waste of money for consumers, but also a waste of the resources it took to grow, process, and transport that food. Much of that wasted food makes its way to landfills where it will slowly rot and release methane gas, a powerful greenhouse gas and super pollutant. But, we have made progress! This year, two major food industry retail and manufacturer associations have adopted voluntary, standardized phrases for food date labels and have asked major companies to begin implementing the new phrases. The new voluntary phrases are "BEST if used by" to describe product quality, and "USE by" to describe a product that may be a food safety concern after a date. We applaud these associations for recognizing the value of standardizing date labels in the fight against food waste and hope to continue these conversations with AB 954. Combatting climate change requires strategies to reduce the amount of landfilled waste and increase recycling for multiple types of materials. Recycling reduces greenhouse gas emissions by lessening the need for natural resource extraction, saving energy in the manufacturing of new products and minimizing landfill emissions. Over the past 30 years, the Beverage Container Recycling Program, which is administered by the Department of Resources Recycling and Recovery (CalRecycle), has raised consumer awareness of the environmental impacts of littering and the benefits of recycling single use beverage containers. However, the program faces significant challenges, prompted by changes in consumer products and behavior, developments in recycling systems, and fluctuations in the global commodities market. Improving Recycling and Remanufacturing—The program has been successful in its initial goal of reducing litter by providing recycling collection opportunities for consumers. However, collection does not ensure that a product is recycled into a new commodity. Future investments should be focused on creating clean, recyclable streams of material, which will improve the recycling and remanufacturing segments of the current system. Enhancing Adaptability and Sustainability— Increases in the recycling rate have resulted in a structural deficit in the Beverage Container Recycling Fund. In addition, the program does not respond quickly to fluctuations in the marketplace. The program must be both nimble and fiscally sustainable. The Administration is committed to collaborating with stakeholders on a comprehensive reform package. To that end, CalRecycle proposes a policy framework that outlines key components of reform. View CalRecycle's Policy Framework proposal to update the Bottle Bill Program. One would think that they’d be able to tell whether or not they lived close to a landfill, right? You might be closer to one that you think. This interactive map shows just how close you are to active and inactive landfills in your area. Many of them have closed and have been converted to parks or inconspicuous grassy hills. Though some are still open and actively accepting trash, and after looking at this map you might get a better idea of where your landfill waste goes. Looking at California on this map it looks absolutely covered in landfills, this is especially true in the Los Angeles area. Considering that the average American produces 4.4 pounds of trash every day it’s astonishing to think that there are only about 2,000 active landfills in the entire country. Although 4.4 pounds may not sound like a lot, think about how many pounds of trash that equates to per year, about 1,606 pounds. Now think about your entire household creating that amount of waste every year, and the entire country. The U.S. creates 254 million tons of waste per year, and unless we start dramatically decreasing that amount we may very well run out of landfill space. This is what makes recycling so crucial to our success. In recent years, Americans have continued to increase the amount waste that is recycled instead of landfilled, but at the same time we’re increasing the total amount of trash we generate. With all of the new packaging materials that products are sold in, recyclers are having a hard time keeping up. When you reduce the amount of waste you generate and when you support Californians Against Waste, you make a huge difference. The more others see you doing things like bringing your own reusable bag or cup and composting your food scraps, the more they’re inspired to try living less wasteful. Supporting CAW and calling your legislators to support legislation that we sponsor helps to make California a more recycling friendly state. With the holiday season coming to an end and all of the post-Christmas trash being wheeled out in curbside bins, now is the time to evaluate the waste that you created and to begin planning how you can reduce your own waste in the New Year. There’s a reason for the order of the phrase ‘Reduce, Reuse, Recycle’. Reducing waste is ideal because using less stuff means less pollution. Reusing products reduces the item’s greenhouse gas footprint, reduces the amount of waste going to landfills, eliminates the need to reprocess materials, and it saves you money! When you’ve reduced and reused as much as you can but still end up with extra materials, it’s now time to turn to recycling. Keep in mind, there are some products that claim to be recyclable but can’t go into your curbside recycling bin, so be wary of those problem products and always check what types of materials your city accepts for recycling. Cardboard: Curbside recycling programs accept flattened corrugated cardboard - just be sure to break down cardboard boxes. Packing materials: Many shipping stores accept packing peanuts, rigid foam packing, bubble wrap and other packing materials for reuse. Call your local store to ask whether it takes the materials. Christmas Lights: If your old holiday lights no longer work first try repairing, but if all else fails be sure to recycle them. If your community doesn't have a seasonal recycling program, you can always mail them in with no recycling fee. Ornaments and decorations: Holiday decorations can be reused for years. However, if you grow tired of the decorations, donate them to thrift stores or post them for free on websites like Freecycle, Nextdoor, or craigslist. Make sure the decorations are in decent condition. Christmas trees: Most communities have Christmas tree pick up or drop off services for residents, if you can’t find any information call your city’s recycling/ solid waste department. If you have a green bin for yard waste, cut your tree into pieces that fit in the bin. Check out the National Christmas Tree Association for other ideas. For all other materials: Use Earth911.com to search for recycling options near you. Thank you for your support this year. We hope you’ll continue supporting us into the new-year as we enter a new legislative session with many important waste and recycling solutions that we’ll be introducing in the first couple months of 2017. Stay tuned for updates on new legislation! If you're like us, your always looking for new zero waste tips. So we put together a list that includes all of the ways that you can waste less during the holidays, a time when an average household's waste increases by 25%. Added food waste, shopping bags, packaging, wrapping paper, bows and ribbons all add up to an additional 1 million tons a week to our landfills (Source: EPA). Instead of buying wrapping paper, use newspapers, like the Sunday comics. Here are some other eco friendly gift wrapping ideas. Instead of cutting down a Christmas tree, or using a plastic tree, give a potted tree a brief (4-7 day) indoor holiday before being planted in your backyard. Another option is to decorate an indoor plant that you already have! Buy decorations at a second-hand store, swap with friends or neighbors, or use organic products like pine cones for decorations. Donate any working but unwanted decorations for reuse. Use energy efficient (LED) lighting. If your old holiday lights no longer work, recycle them. If your community doesn't have a seasonal recycling program, you can always mail them in with no recycling fee. Give the gift of experiences instead of material goods - such as outings, time, favors, memberships, or donations to a non-profit in honor of a friend or family. You can also make a donation to CAW on behalf of another person - it's easy, there's no wrapping or waste involved, and it’s tax-deductible! Make your own upcycled or DIY gifts. Whether it’s traditional food, a thoughtfully homemade decoration, or a photo album, you can guarantee that your gift will truly be appreciated. Consider electronic holiday cards and invitations. Make your own or use a website for help. You can even add a personal photograph to e-cards. Check out some free e-card websites here. Support your local economy by buying from local small businesses, craft shows or antique/thrift stores. Look for high-quality and long lasting items made from recycled content, repurposed and/ or sustainable materials, and avoid heavily packaged gifts. Consider the end-of-life disposal option for the product - is the item recyclable? Safe for disposal? Does the product manufacturer or a retailer offer take back of their items? If you plan to purchase electronics, take a look at Greenpeace or Electronics Take Back Coalition's 'report card' on sustainable electronic product. Remember to bring your reusable bags to the store when you're shopping. Keep them in a visible location in your car so you don't forget. Consolidate shopping trips and carpool to holiday celebrations to reduce your gasoline consumption. If you are having guests over be sure to serve food and drinks on reusable plates, utensils, and glasses rather than disposable items. Cut food waste by planning meals wisely, composting food scraps, freezing leftovers, and asking guests to bring Tupperware to take home extra food. After the holiday season, make sure you donate, sell or recycle outdated or unwanted items to get ready for the New Year. Happy Holidays from the CAW team! Did you know that from Thanksgiving to New Year's Day, household waste increases by more than 25%? (Source: EPA). All of the added food waste that is destined for a landfill after thanksgiving, unless you are lucky enough to live in an area that provides organic waste collection, translates to more methane emitted into the atmosphere. Here are some ways you can reduce your own waste during the holidays, and if we all make changes in our wasteful habits we can collectively make big difference. 1) When shopping for meals. Don’t forget your reusable bags! This is the first thanksgiving that the statewide bag ban will be in place, so no matter where you live in California single use plastic bags will banned. 2) Reduce, Reuse, & Recycle. Serve food with washable napkins, utensils, plates, and glasses, rather than disposable items. If you have to use paper plates, buy ones that are made from recycled content. Set out recycling bins for glass bottles and aluminum cans, and if you compost at home or your waste collection service offers organic waste pick up, set out a bin to collect compostables like food waste and paper plates from guests. 3) Don’t waste food. Three times as much food is wasted during the holiday season than during the rest of the year. For leftovers, either freeze them or ask your guests to bring their own Tupperware to take them home in. 4) Try to consolidate shopping trips and carpool to holiday celebrations. If everyone reduced holiday gasoline consumption by one gallon (about twenty miles), we'd reduce greenhouse gas emissions by one million tons (Source: Use Less Stuff). If driving long distances, be sure to check the air in your tires to achieve optimal gas mileage while traveling. 5) The holidays are a time for giving. Volunteer and donate food or other necessities (blankets, clothes, toiletries) to local groups that help those who are in need. Get into nature and clean up a local trail, beach or waterway. 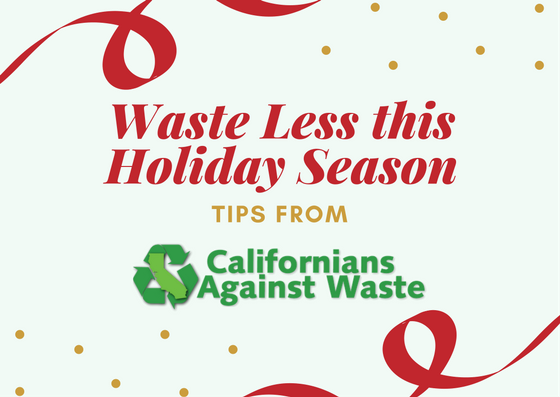 Give the gift of less waste by supporting Californians Against Waste! 2.5 million Samsung Galaxy Note 7 phones have been globally recalled due to instances of batteries exploding, resulting in a major loss in rare earth minerals and a mountain of e-waste. This is the second recall for this phone model, the first recall resulted in replacement phones. When the replacement phones were also found to also catch fire, Samsung asked customers to shut off their phones and return them altogether. The fact is that not all of these phones will make it back to Samsung for recycling and even if they do a large percentage of the materials that make up these devices can’t be recovered. The bulk of the waste caused by these defective batteries could have been prevented if Samsung hadn’t designed the phone batteries to be glued in. If the phones would have been manufactured with easily removable batteries, the solution could have been as easy as mailing Galaxy Note 7 users a new, less explosive, battery. Instead we are left with 2.5 million, practically new, phones that can no longer be used. The average smartphone, which weighs less than a pound, requires about 165 pounds of raw mined materials according to the Institute of Electrical and Electronics Engineers. The Samsung Galaxy Note 7 on the other hand, was one of the largest and most advanced smartphones and required close to 500 pounds of raw minerals. This phone contained about 50 different elements, less than 25% of which are recoverable in the recycling process. The planet’s reserves of rare earth minerals used in electronics are quickly diminishing, and it’s becoming more obvious that we need to drastically change the way we manufacture electronics in order to make products more easily repairable and recyclable. This event was an environmental tragedy and we hope all smartphone manufacturers will learn from this and make their products with repair and recycling in mind. Read more about California's existing e-waste laws. Remember those old bulky TV’s? Just because they have largely been replaced by flat panel and LCD television doesn’t mean they’ve all disappeared. Many are still stored in the attic, guest bedroom, gathering dust until they make their way to an e-waste recycler. For the last few years in California the only paths for recycling the glass that comes with old bulky Cathode Ray Tubes (CRT) TVs and monitors are lead smelting, glass-to-glass recycling (manufacturing more CRT devices), or hazardous waste landfills. Many e-waste recyclers in California have been resorting to disposal ever since the world’s only CRT glass-to-glass recycling operation in India has shut down and reopened, leaving many concerned with their reliability. Lead smelting is only an option for a small volume of CRT glass due to smelting’s low capacity. According to a state report, 21.8 million pounds of CRT glass handled in California has been disposed of since January 1st, 2016 instead of being recycled. That is unfortunate because a large chunk of CRT glass (known as CRT panel glass) is recyclable. Not only is this material not being recycled but e-waste recyclers are either stockpiling this material or paying for the disposal instead of achieving the true benefit of recycling which is replacing virgin materials. In some cases this has caused e-waste recyclers to go out of business. When an e-waste recycler shuts down, it not only affects the employees of that business but also the nearby residents who rely on that recycler to take care of their community’s e-waste. A CAW-sponsored bill, AB 1419 by Assemblymember Susan Eggman, recently signed into law by Governor Brown will bring new recycling opportunities for panel glass, which is the largest portion of CRT devices. This bill allows for specified end-uses of panel glass, after it’s been cleaned and processed, for use in new products such as tiles. Keeping electronic waste out of landfills allows valuable resources to continue circulating in the economy, lessening the need to mine or manufacture more material. Recyclers will now have a newly allowed recycling path for CRT glass, helping to keep their businesses open and providing Californians with the essential service of e-waste recycling. Thanks to the ongoing support of our members and all of our supporters who took action, our efforts to help pass a monumental piece of legislation has succeeded! Today, Governor Jerry Brown signed a bill that has made California the state with the toughest reduction targets for Short-Lived Climate Pollutants in the entire nation. Short-lived Climate Pollutants, or Super Pollutants, are toxic air contaminants that pose significant environmental public risks, including premature death. SB 1383, by Senator Ricardo Lara (D-Bell Gardens), requires the California Air Resources Board to implement the short-lived climate pollutant strategy to achieve a reduction in the statewide emissions of methane by 40 percent, hydrofluorocarbon gases by 40 percent, and anthropogenic black carbon by 50 percent below 2013 levels by 2030. Organic waste materials make up two-thirds of the state’s waste stream and when disposed of in landfills they generate methane, a Short-lived Climate Pollutant that is many times more potent than carbon dioxide. In order to achieve methane reductions SB 1383 creates the target of a 75% reduction in the disposal of organic waste from 2014 levels by 2025. This will reduce methane emissions from landfills by diverting organic waste to be better utilized as soil amendments. Additionally, this law includes a goal to recover 20% of edible food that is currently disposed to be better utilized to feed the more than 6 million food insecure Californians. Food waste is the most prevalent item in our landfills, and nearly 2 out of every 5 lbs of food produced is never eaten. In addition to avoiding landfill methane emissions, the diversion of edible food landfills allows it to be better utilized either to feed hungry people or animals in the case of food rescue. The methane reductions that this bill creates will provide immediate beneficial impacts to air quality, public health, and climate change. Help us continue our work as we fight for statewide solutions to waste reduction and recycling.